Home»China-like Tableware»Masterpiece Collection - Gold and Silver»Gold Masterpiece LOOKS LIKE CHINA!! Gold Masterpiece LOOKS LIKE CHINA!! Masterpiece plates have such a genuine china look that even while fully aware that they are heavy weight plastic, you will still cringe if one falls to the floor. In addition to the 10 inch, 7 inch and 6 inch plates, Masterpiece plates also come with a matching coffee mug so everyone can get their caffeine fix and still stay stylish. Check out our silver metallic cutlery that will look great with this setting. 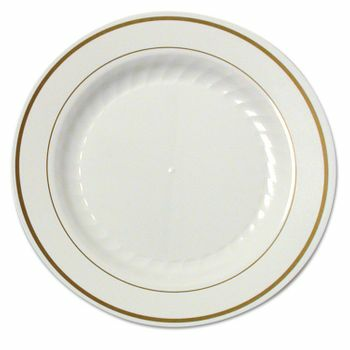 Ivory / Gold Masterpiece 10" Plastic Dinner Plate 12ct. Ivory / Gold Masterpiece 9" Plastic Luncheon Plates 12ct. Ivory / Gold Masterpiece 7" Plastic Salad Plate 15ct. Ivory / Gold Masterpiece 6" Plastic Cake / Dessert Plate 15ct. Ivory / Gold Masterpiece 10oz. Plastic Bowl 15ct.